Two years into the job, Pope Francis continues to riding a growing wave of popularity not just among Catholics, but also in the eyes of non-Catholics and non affiliated folks. 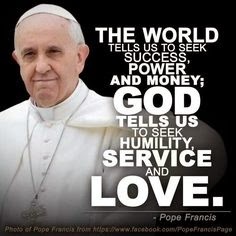 Francis is considered to be one of the most charismatic popes of the modern era, his popularity is reaching the levels enjoyed buy the beloved Polish Saint John Paul II, who was pope from 1978 until his death in 2005. The very human and humble leader of the world's 1.3 Billion Roman Catholics says he hasn't watched television since July 15, 1990, when he vowed to not watch it anymore. However, the vow came at a cost. He can not watch his beloved San Lorenzo soccer team. Fortunately he says one of the Swiss guards gives him the low-down on the latest scores and standings. He says he would liek to eb remebered as "Este era un buen tipo que trató de hacer el bien." which translates to a good guy who tried to do good. He appears to be missing his anonymity. He told the paper he misses the ""The tranquility of walking the streets. Or going to a pizzeria to eat a good pizza.". Simple pleasures for a humble man of the people. I wonder how he might enjoy a feed of toutons covered in molasses? Pope Francis is a good argument for Christianity.